Century Studios is pleased to present a new reproduction Tiffany shade pattern to our offerings, the 16″ Peacock Feather. The bold design of this shade has the symmetry of a repetitive geometric pattern softened by natural curves of a feather. The shade was created for a California client and is shown on the Greek Urn base (overall lamp height 21.5″). Taking our color inspiration from an original Tiffany example, this shade is primarily made from Lins glass. The Lins Glass Foundry was based in Florida and closed in the late 1990’s. 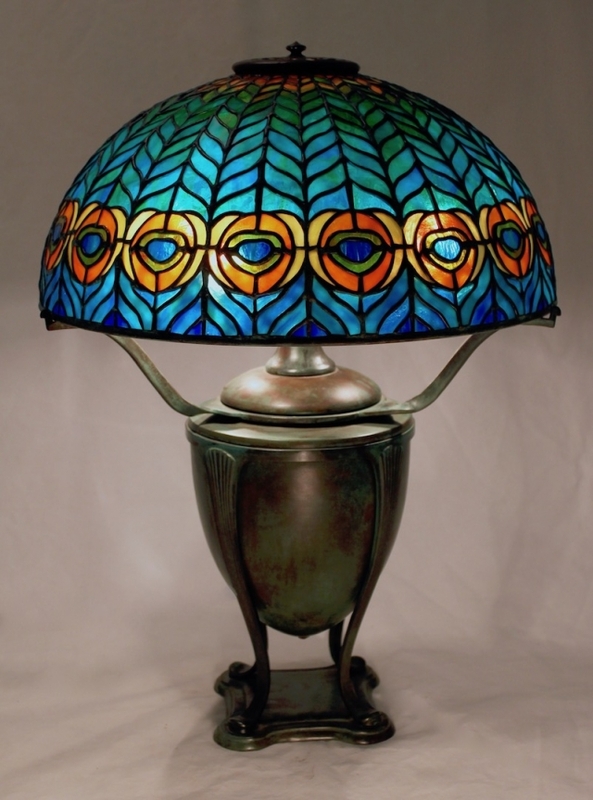 Lins glass is highly prized by glass artists for its Tiffany-esque properties. Beginning with a strong amber tone at the top, the color shifts through green to teal, ending in cobalt blue at the bottom. 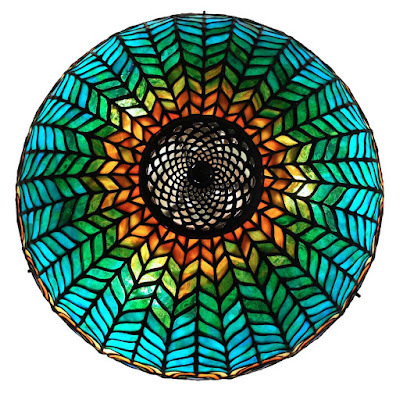 These colors are reflected in the peacock “eyes” that encircle the lower portion of the shade. The playful coloration of the finished piece is bold, yet subtly modulated.